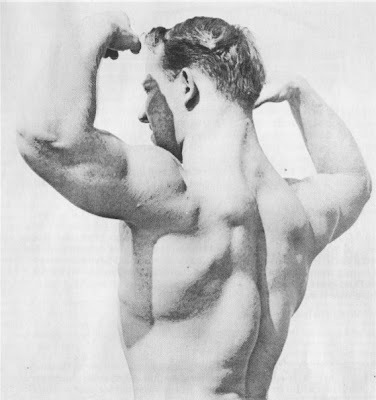 Without a doubt the lower part of the back is the most important area of the body, although I don’t fell that this is the most popular area with the majority of bodybuilders. This may be because this part of the physique is not as noticeable as other bodyparts, nor is it discussed and emphasized as other sections of the body. Yet this area is far more valuable than it is recognized to be, and development in this section of the body will contribute a great deal more to overall strength, better health and posture than any other muscular region of the body. Specialists who study the spine, nerves and mechanisms of the body tell us that posture plays a very important role in relation to health. The organs of the body perform better and more efficiently when the spinal erector muscles are developed to keep the body upright. These muscles also help to keep the back strong and free from complaints so prevalent in this modern day of easy living and not enough exercise. I spent several months in rehabilitation work for the physically handicapped, and back injuries seem to head all other types of injuries. Some cases were caused by great force being brought on the area, such as automobile accidents, injuries suffered in coal mine cave-ins, and injuries sustained in various sports all seem to affect the spine in varying degrees. Of course such injuries could have happened regardless of the degree of development, yet we know that the outcome of such accidents are often determined by our condition to withstand these pressures. But what about the injuries that should not have happened had a little thought and preparation been followed? There are thousands of people that receive injuries in the lower back by twisting or bending over to tie their shoe, or sneezing, or missing a step, etc. This doesn’t seem right to me. If the muscle is fully developed it holds the spine in place and prevents many of the injuries that normally happen only because the individual has a weakness in that area. Everyday stress and strain places a need for good, strong development of the lower back. This region, along with the abdomen, seems to be among the most neglected of the body, resulting in weakness and an overweight condition. I can speak with some authority on the matter because I myself have suffered a few back injuries along the way. I have a slight congenital condition of the spine, one which I became conscious of very early in life. The pre-existing condition was brought to light while participating in football during my high school days. Contrary to the examining doctor’s advice, I played football for weeks in my senior year with the help of a back brace. At that time there wasn’t any weight training program at out school, and I actually didn’t get acquainted with weight training until I attended college. Since beginning weight training I have injured my back several times, usually through not showing good judgment or through ignorant zeal. But the sensible training I have done has helped to strengthen my back and prevent many a painful event that might have occurred had my erector muscles been less strongly developed. On one occasion while working with the Rehabilitation Center at the University of Kentucky, I was carrying a patient in my arms who weighed over 200 pounds. On descending a flight of steps my foot slipped, and so did my already weakened disc. I suffered a very nasty back injury and had to have my back X-rayed. Upon receiving the diagnosis the doctor suggested an operation. I was against any operation and felt this would be only as a last resort. I felt certain that through a series of well-planned exercises and time I could heal and strengthen my back, and I did. I now feel that the best assurance against further trouble in this area is to make sure I get the proper exercise that will keep this region strong. For those who have had any type of back trouble or any back operations a regular training program for the lower back should be undertaken. I feel positive, and this is speaking from my own experience, that everyone can improve and strengthen the lower region of the back through properly selected exercises such as I have outlined here. Naturally care must be exercised to achieve progress gradually, which should assure one of success in time. Here’s an interesting case I like to mention, about a friend of mine who suffered a back injury from a fall from a horse and ruptured a disc in the process. He began to do strengthening exercises for his lower back. Within several months his back bothered him less and less. In time he grew interested in lifting. Later he was able to win the 132 lb. weightlifting title, proving that progressive exercise can overcome many back injuries when employed properly. I am amazed at the progress that Norb Schemansky continues to make in his weightlifting career after having submitted to two back operations. His back is undoubtedly developed to such an amazing degree that it enables him to handle and support the tremendous poundages he lifts. Of course, few men are as strong as Norb, and because he developed and strengthened his muscles so gradually, he is one of the strongest men in the world today. Beginners especially should take care to see that they begin their training by paying attention to those exercises that develop and strengthen this part of their physique, always doing some type of exercise for the lower back. This section, the lower back, is often neglected in favor of other areas, but these areas do not contribute near as much to health or strength as the lower back. In my opinion I don’t think any section should be neglected. Include one or two lower back exercises in every workout, and occasionally change them around for the sake of variety and more rounded development. Make your lower back strong before participating in a lot of heavy, overhead movements. Play it safe and never push yourself to your limit too often in lower back work. Remember the old saying: An ounce of prevention is worth a pound of cure. Personally I have always felt that in the majority of cases a bodybuilder would be wiser to start his workout schedule with leg work, then follow this with exercises for the back. I believe this would contribute more to his overall strength and health and be more conducive to promoting better athletic ability. I consider training that involves the larger muscle groups, which influences them to work as a unit, excellent, because it builds a good foundation on which some specialization can follow. Competitive lifters as a rule have very good erector spinae development due to the many exercises they include in their training for this area. Doing many sets of deadlifts, squats, cleans, snatches, high pulls, etc. gives the lifter all the exercise he needs for the lower back. Of course the lifter needs good development in this region. This area is the seat of basic power and combines forces with the hips and legs. Time spent on lifting and power exercises will do much to give you a better all-round physical development. 1.) Swing With Dumbell – This exercise is a great one for the lower back and can also be used as a warmup. The movement is performed by grasping the dumbell with both hands, knees slightly bent. Allow the weight to swing back between the legs and then overhead. The exercise can also be done with one hand, working the other hand as well. Use 3 sets of 8 reps. 2.) Cleans With a Barbell – A very good movement to develop and build strength in the entire back. This movement is included in training programs for the lifter. The starting position is with knees bent, back flat, arms straight and head up. Begin the initial pull with the legs and lower back, with the arms and shoulders taking over the later phase of the movement. After you have pulled the weight as high as possible, dip under the weight by bending at the knees and catching the bar at the shoulders. For general purposed I would recommend 3 sets of 5 repetitions. 3.) 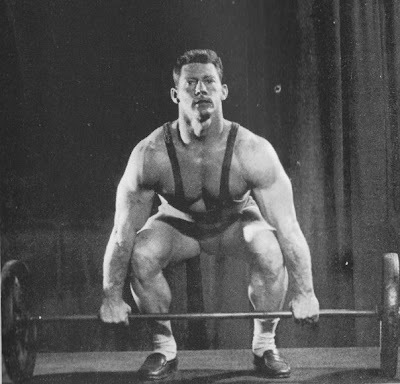 Deadlifts – This is perhaps one of the best movements for the back and hip area. A lot of power can be built with this exercise. However, I would caution the beginner not to overextend himself in this movement until he has succeeded in developing his lower back to the limit. Too much weight exerts too much pressure on the spine in general and might result in an injury. Work progressively and you will eliminate all dangers of strain and injury. I think 3 sets of 10 repetitions should prove ample at first. When more strength is obtained and more is desired, you can use heavier weights and lower reps, but this should not be attempted until you have fully strengthened your back through progressive training. 4.) Hyperextensions – This movement concentrates all the resistance to the spinal erector muscles, strengthening them tremendously. I feel this is a very good therapeutic movement. You can feel the resistance fully as you arch. Advanced lifters often use weight across their shoulders for added resistance. Personally, I think excellent results can be obtained by increasing the resistance slowly and never trying to see how much you can do. It’s a good exercise and should be included in your routines. Try 3 sets of 10 to 20 reps. These four exercises are some of the finest back developers to be found anywhere, and anyone from a rank beginner to the strongest man can utilize them simply by adjusting the poundage to his strength. Bear in mind that weight is not the only important thing in these exercises, unless you are trying to establish a personal record. The way you perform the exercise is always important. Break into your any lower back training program gradually and work in a slow but steadily progressive manner. You will obtain many benefits and you can keep a close eye on your progress. Make your back a strong one . . . you’ll never regret it.